Chimera and fantastic beasts were a favorite subject of jewelry makers at the turn of the 19th century. 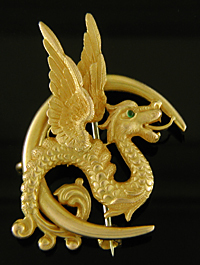 The jewels of the era were graced with a golden menagerie of griffins, basilisks, dragons and slithering toves. 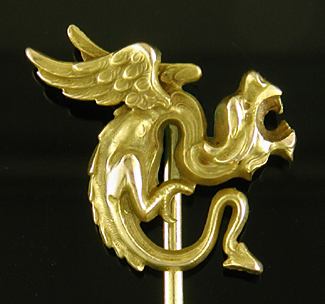 This finely sculpted stickpin created by Carrington & Co. features a fierce dragon menacingly crouching, as if ready to breath fire. Crafted in 14kt gold, circa 1900. 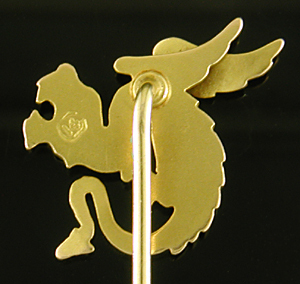 The back of the stickpin (below) illustrates the care with which Carrington & Co. created jewelry. Note the stout pin stem which is anchored to the back of the dragon with a sturdy collet. Also note, the clean surfaces and edges on the back that are as nicely finished as the finely detailed front. The maker's mark of Carrington (a boxy "C" enclosing "14") is stamped on the upper right of the reverse. Measurements: This stickpin is 2 9/16" long and weighs 3.5 grams. The dragon top is just under 5/8" tall by 3/4" wide.